and I think it must have something to do with the fresh strawberries & cream associated with Wimbledon, washed down with a cool glass (jug) of Pimm’s or Champagne! There’s nothing tastier than a British strawberry, so red and juicy and sweet. You don’t need to do much with it when it’s in season or you’ll detract from its beauty. When strawberries are this easily available and cheap, then you just have to buy several punnets and enjoy them every day, in as many different recipes as possible. Eating them straight from the box is obviously the best way, but I add a handful to my breakfast granola or smoothie in the mornings and my girls can’t get enough of them as a snack or as a pudding – they eat them plain and always get covered in lots of sticky red juice! Serving strawberries with cream is a very English tradition, especially at Wimbledon; but I love to adorn a classic crème patisserie filled tart with the red jewels. I often get asked what is my favourite thing to bake for myself, and I always say that I don’t have a sweet tooth and so enjoy a loaf of bread….that is unless I make crème patisserie for choux buns or a sweet shortcrust tart, then my will power goes out of the window and I’ll happily scoff the lot. 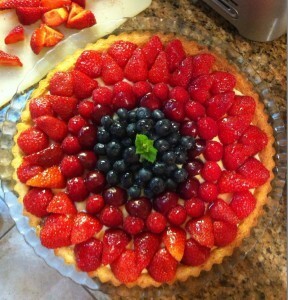 You can of course decorate the tart with any fruits you like and I often do a rainbow effect using mango, kiwis, blueberries, etc. But if I make the tart and there are soft fruits in season, then they will win hands down, from fresh cherries to blueberries, raspberries and of course strawberries. Finish the tart with an apricot jam glaze, just so it wouldn’t look out of place in the window of a French Patisserie. Sadly you have to share the tart with others, but it will never fail to impress and what a treat to make for your family over the weekend whilst you watch and Cheer the British contingency at Wimbledon. 2. Next cut a vanilla pod in half – be careful not to scrape the seeds out – they’ll naturally fall out in the milk when it gets heated on the hob. Heat the milk with the vanilla pod until it’s just over body temperature – don’t let it boil. 3. Whilst the milk is warming, whisk the egg yolks, sugar, plain flour and corn flour in a large bowl until pale and light. Remove the vanilla pod and gradually add the milk to the egg mixture and whisk continuously until all the milk has been added. Make sure the milk isn’t too hot otherwise your eggs will begin to cook. 4. Transfer the mixture back to the saucepan and bring to a boil, letting it bubble a little and stirring throughout. Remove the mixture and transfer to a clean bowl and then cover with cling film so as not to let a skin form on top. Place in the fridge for a few hours to cool completely. 5. To make the pastry, place the plain flour, salt, icing sugar and cold butter into the food processor and pulse until the mixture resembles breadcrumbs. The reason I use icing sugar is because I think it gives you a much smoother pastry than using normal sugar which tends to have a more gritty texture. 6. Next, add the egg and 2-3 table spoons of cold water a little at a time until a ball of dough is formed. Tip the dough out onto a lightly floured surface to knead a little before wrapping in cling film and resting in the fridge for at least an hour. 7. Grease a 10 inch tart tin and put to one side until needed. 8. Once the pastry has chilled 7 rested, bring it out of the fridge 10 minutes before you need it. On a lightly floured surface, roll out the dough and carefully line the tin. Gently ease the pastry into the corners of the tin and leave the pastry over hanging as it may shrink a little while baking. Chill in the fridge for 20-30 minutes. 9. Preheat the oven to 180 degrees Celsius. Line the pastry shell with cling film and either baking beans, rice, lentils – whatever you have to hand to weigh the pastry down as it blind bakes in the oven for 15 minutes. Make sure your cling film can withstand the heat in your oven. 10. After this time, remove the beans and cling film and place back in the oven for a further 7 minutes to give the tart a chance to colour. 11. Once out of the oven, leave to cool a little before trimming off the overhanging pastry with a sharp knife to leave a clean and neat edge to the pastry. The shell needs to cool completely before being filled with the crème patisserie and fruit. 12. Whilst the cases are baking/cooling, prepare some fruit for you toppings – you can use any fruit you want, but as soft fruit are in season in Britain at the moment, I’m using summer fruits – they’re super delicious and always make me feel summer….even if it’s raining outside! Slice the strawberries and grapes in half, but leave the blueberries and raspberries whole. 13. To assemble the tarts, remove the pastry shell from the tin and place on a chopping board whilst you fill and decorate it. 14. Pipe the crème patisserie neatly into the shell then layer the fruit on top. 15. Heat a good amount of apricot jam in a small saucepan to glaze the tart at the end – this is optional, but I always think it’s worth the effort. Garnish with a small sprig of mint and serve straight away with a chilled glass of Prosecco.